When it’s stinking hot outside, there’s nothing quite like retreating into a book about dark forests and glaciers. 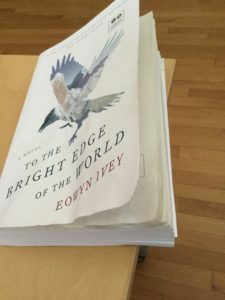 Eowyn Ivey’s To the Bright Edge of the World is a fantastic adventure story about an 1870s expedition through an uncharted part of Alaska Territory. It’s also a wonderful love story. Dive into this Alaskan adventure tale. Just don’t drop it into the pool. As you might be able to tell from the condition of my copy, I did a good bit of my reading in the pool. I loved this book, which I reviewed for The Dallas Morning News. I recommend it highly. Amy Gentry’s Good As Gone is not set in a cool climate – Houston is, as I like to say, muggy and buggy. This debut, the story of a child kidnapping that echoes the real-life story of Elizabeth Smart, is nuanced and smart. It’s not a run-of-the-mill thriller. As I wrote in my review (again for The Morning News), it has interesting insights into violence against women. This is another worthwhile read. The other thing that’s hot this summer, of course, is political rhetoric. No matter which side of the presidential campaign you come down on, a dose of historical perspective is always useful. Jeffrey Toobin’s book on the kidnapping of Patricia Hearst, American Heiress, was a fascinating dive into the overheated politics of the early 1970s. As a kid, I obsessively followed the Hearst kidnapping in the newspaper, and Toobin’s book really helps put this bizarre incident in context of the era. For instance: In 1974, there were 2,044 politically motivated bombings in the United States that killed 24 people. All these years later, people still debate whether Hearst should be considered a victim or a villain. Toobin wrote one of the best books about the O.J. Simpson case, and he’s done good work again here dispassionately dissecting a legal controversy.